Salman Arshad is a Web Developer responsible for all programmatic and many graphic design elements our websites. He holds a B.S. degree in Computer Science from University of Karachi and has worked in the field for the over ten years. His major expertise includes legacy ASP/SQL Server and PHP/MySQL. He is a perfectionist when it comes to his work. 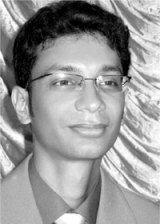 Salman has worked as a web developer for various companies and people in the past. The list includes a renowned Internet Service Provider based in North Carolina, US, a web-designing and development company in Newcastle, UK and a lively person from Sweden. He has been chief designer of our websites and systems for about three years and passion about the quality he builds. Salman is married and enjoys every minute spent with his family. The very little spare time he has is spent either on his programming blog or on online gaming servers.